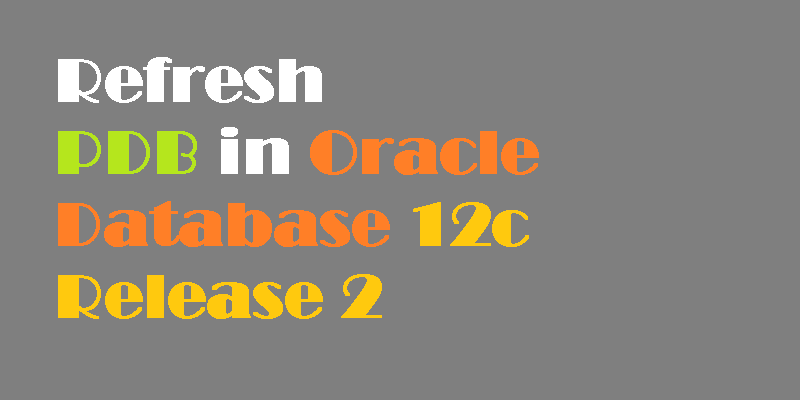 This article will guide you through the steps to refresh pdb in oracle database 12c release 2. It is possible to refresh the contents of a remotely hot cloned PDB provided it is created as a refreshable PDB and has only ever been opened in read only mode. The read-only PDB can be used for reporting purposes, or as the source for other clones, to minimise the impact on a production system when multiple up-to-date clones are required on a regular basis. The prerequisites for a PDB refresh are similar to those of a hot remote clone. In addition to the prerequisites for hot remote cloning, you must also consider the following. cdb1 : The local database that will eventually house the refreshable clone. cdb3 : The remote CDB, used for the source PDB (pdb5). Create a new PDB in the local database by cloning the remote PDB. In this case we are using Oracle Managed Files (OMF), so we don't need to bother with FILE_NAME_CONVERTparameter for file name conversions. In this case we are using manual refresh mode.